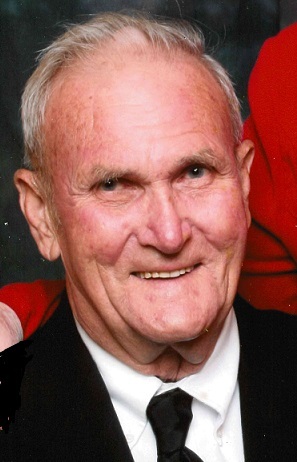 William “Harold” Ball, 88, passed away April 16, 2018 at Norton’s Pavilion in Louisville, Kentucky. He was born in Lewisport, Kentucky on February 17, 1930 to the late John and Myrtle (Coyle) Ball. Also preceding him in death was his first wife, Edna (Thorn) Ball; daughter, Diana Ball; step daughter, Diane James; sisters, Elizabeth Smith and Mattie Coiles; brothers, George, John and James Ball. Harold was a U.S. Army Veteran and lifelong member of V.F.W. Post #2939. He was united in marriage on June 30, 1991 to the former Linda (Amos) Sabelhaus. He retired as chief engineer of a tow boat. He has worked at the former Cannelton Sewer Pipe and had owned and operated the Horseshoe Bar, formerly in Tell City. He enjoyed gardening and spending time with his grandchildren. Surviving are his wife, Linda Ball of Cannelton; children, Janie Hanks (Robert), Anderson, SC, Jerry Ball (Kathy), Cannelton, Debbie Vogt, Cannelton; step children, Frank Sabelhaus, Jr. (Darlene), Tell City, Richard Sabelhaus, Cato, Kathy Sabelhaus (Mark Ramsey), Tobinsport, IN, Dewayne Sabelhaus (Shirley), Tell City, Laura Sabelhaus, Tell City, Robin Ambs (Rick), Cannetlon, and Stephen Sabelhaus (Carla), Hawesville, KY; a sister, Kathleen McCarty (Frank), Owensboro, KY; several grandchildren, great grandchildren, and great-great grandchildren. Funeral services will be held at 11:00 AM CST Wednesday, April 18, 2018 at Huber Funeral Home, Tell City Chapel. Rev. JT Hills will officiate. Burial will follow in New Cliff Cemetery, with military rites by the V.F.W. Visitation will be Tuesday from 2:00-7:00 PM and Wednesday 9:00-11:00 AM at the funeral home. Memorial contributions may be made to Perry County Relay for Life.